Plantation, FL (November 12, 2018) – Darrelle Revis Foundation, founded by recently retired NFL Super Bowl champion Darrelle Revis, has partnered with Miami based COX Media’s 99 JAMZ and HOT 105 to distribute 1,000 turkeys at the Little Haiti Cultural Arts Center. A South Florida resident, Revis will continue to fulfill his foundation’s mission of ending the childhood hunger crisis in America through giveback initiatives like this upcoming Thanksgiving turkey drive. 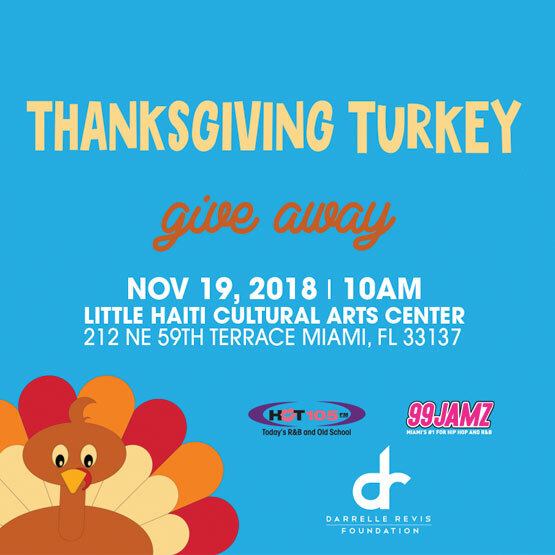 On Monday November 19th, during a live broadcast remote, Revis will pass out turkeys to families in need alongside radio personalities that include Supa Cindy, DJ Nasty, Big Mack, Big Lip and Shelby Rushin. The Darrelle Revis Foundation is a nonprofit organization committed to fighting childhood hunger in America. The foundation’s goal is to educate our youth on the benefits of eating healthy to ensure that all kids in America have access to healthy food consistently. It is our belief that childhood hunger is solvable and unjust in a nation that has such an abundance of resources.